In April 1979 the Albuquerque Police Department began a special enforcement program aimed at reducing the number of DWI (driving while intoxicated) accidents. The program was administered by a squad of police officers, who used breath alcohol testing (BAT) devices and a van that houses a BAT device (Batmobile). These data were collected by the Division of Governmental Research of the University of New Mexico, under a contract with the National Highway Traffic Safety Administration of the U.S. Department of Transportation, to evaluate the Batmobile program. The first 29 observations are for a control period, and the next 23 observations are for the experimental (Batmobile) period. The data, freely available at http://lib.stat.cmu.edu/DASL/Datafiles/batdat.html, consist of two variables: ACC, which represents injuries and fatalities from Wednesday to Saturday nighttime accidents, and FUEL, which represents fuel consumption (millions of gallons) in Albuquerque. The variables are measured quarterly starting from the first quarter of 1972 up to the last quarter of 1984, covering the span of 13 years. The following DATA step statements create the input data set. There are a number of ways to study these data and the question of the effectiveness of the BAT program. One possibility is to study the before-after difference in the injuries and fatalities per million gallons of fuel consumed, by regressing ACC on the FUEL and the dummy variable BATPROGRAM, which is zero before the program began and one while the program is in place. However, it is possible that the effect of the Batmobiles might well be cumulative, because as awareness of the program becomes dispersed, its effectiveness as a deterrent to driving while intoxicated increases. 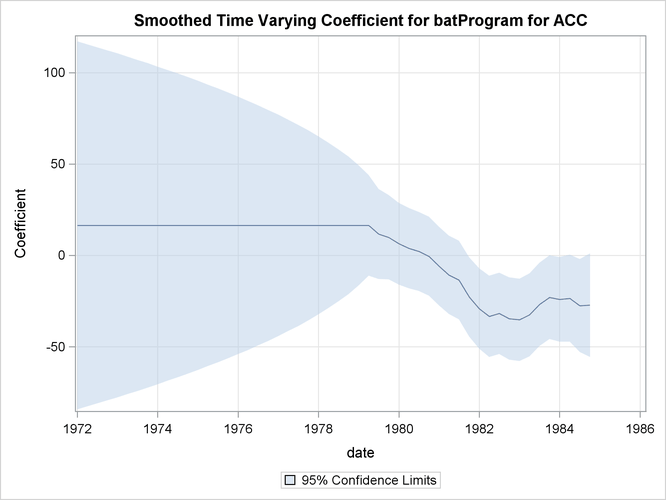 This suggests that the regression coefficient of the BATPROGRAM variable might be time varying. The following program fits a model that incorporates these considerations. 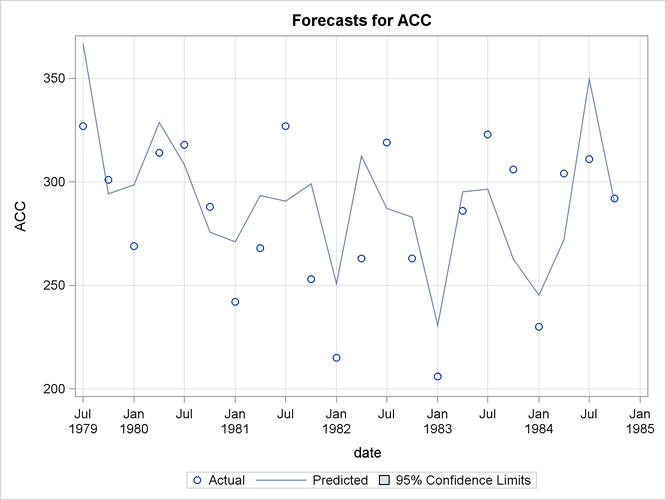 A seasonal component is included in the model since it is easy to see that the data show strong quarterly seasonality. The model seems to fit the data adequately. 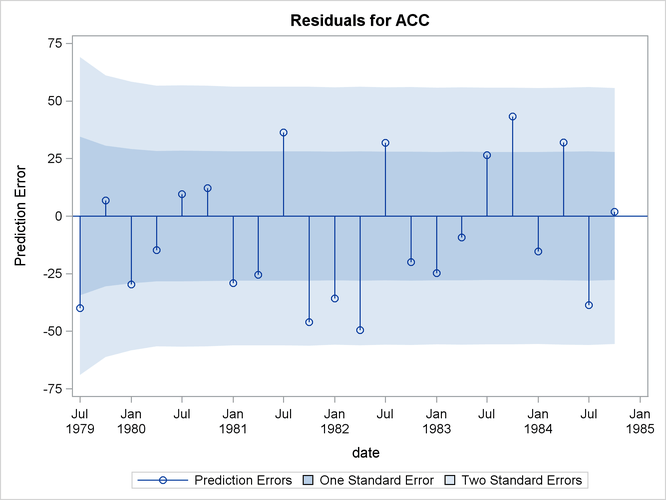 No data are withheld for model validation because the series is relatively short. The plot of the time-varying coefficient of BATPROGRAM is shown in Output 34.4.1. As expected, it shows that the effectiveness of the program increases as awareness of the program becomes dispersed. The effectiveness eventually seems to level off. 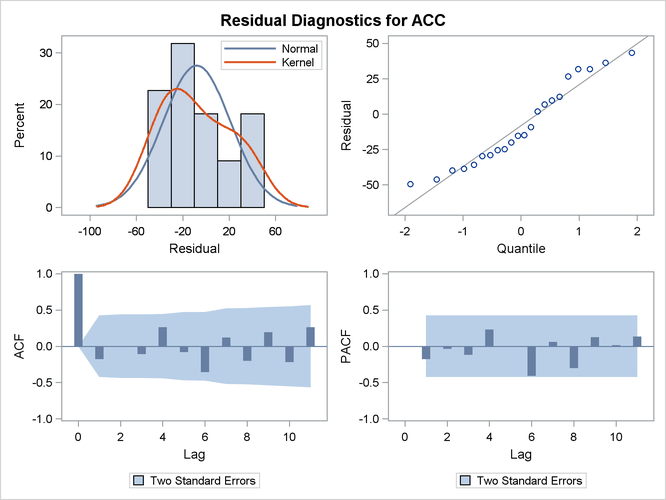 The residual diagnostic plots are shown in Output 34.4.2 and Output 34.4.3, the forecast plot is in Output 34.4.4, the goodness-of-fit statistics are in Output 34.4.5, and the parameter estimates are in Output 34.4.6.